You can see the full post and video over on the Ellen Hutson classroom blog here. ** UPDATED with the winner: Christy Q! Congratulations! You have a gift of combining lots of different colors and textures so well, you make it look effortless. I love that plaid w the silver sparkle...how pretty is that? Love your fun, sparkly card! Thanks for the awesome video showing your tips and great tricks!! I love coffee andI love the Ellen Hutson store, so this post is in my wheelhouse! heading over to the classroom now! Thanks! Just fabulous! Love those little winter cups and the touches of silver and sparkle make it look so fun and frosty. Love the plaid and the sparkle. Love the coffee cup. Looks like one I got for Christmas a couple of years ago! I'm a sucker for snowflakes. Love that card. I enjoyed your video, Stephanie! The glittery coffee cups are fun and the details of embossing paste and glittery snowflakes are just beautiful. You have a great talent for design, thanks for sharing it! Great tutorial for applying glitter and then coloring with alcohol markers. The ombre effect is gorgeous. And this coffee stamp set is so versatile. It's truly one set that can be used year round. 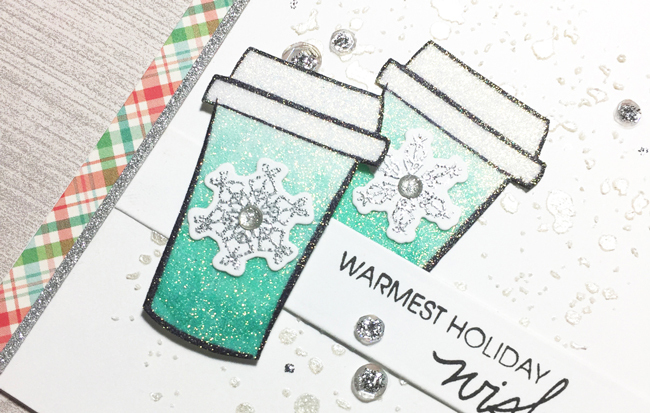 Stephanie, your glittered coffee cup card is adorable! My favorite color with glitter! I love it! This is such a great card. Love all of the glittery elements you've added. I have done the glitter on the tape before but never coloured it after, such a fantastic idea. Stephanie, you are very clever AND talented! Very cute card! I really like all the coffee cup dies and stamps, there so cute! And they are really fitting since so many of us are addicted to coffee! Wow! Love yhose glittery cups! Beautiful ombre color too. Thanks for the inspirarion, tutorial at EH blog and a chance to win! Talent? Yes! Thanks Ellen for the chance to shorten my wish list. I LOVE coffee too and this is a fabulous glittery, coffee, holiday card! What a great combo - caffeine and sparkles. Love these colors and the freshness of your design. Thanks for sharing! So Pretty! Love that turquoise! A fabulously sparkly card! Great use of the embossing paste. What a beautiful card! I loved the tutorial showing how you colour on glitter. Can't wait to give it a try!! Took a quick tour of your blog... you have such a sweet style of cardmaking...and those owl ornaments are ADORABLE!! Instead of hot coffee this reminds me of my favorite drink - iced latte. It's so pretty and sparkly! Love the sparkle with your coffee. I am excited about using stencils with embossing paste. A nice demention. A pretty card with sparkling coffee cup! Thanks for the chance to win a shopping spree at Ellen's. Love your card! I love all things that sparkle! Coffee and cards and glitter are 3 of my favorite things! Love your glittery coffee cup card! You've inspired me to try out embossing paste on my projects. An AMAZING amount of glitter and shine and I LOVE it! Happy New Year too! great tip on making your on glitter cardstock! You can never have too much glitter! Lovely card and thanks for the inspiration. Very pretty with all the sparkle and I like the strip of plaid. I love your work! I am always amazed at what you can do with a few supplies. I love glitter! Anything to make these dark PNW nights sparkle! That coffee cup is just magical. Your coloring inspiring. Love the simplicity of this wonderful little card. Also, I love ideas using stamps I already own! Thanks for sharing your talent, and thanks also to EH for this generous chance to win shopping from my favorite store! This is such a cute card, Stephanie. I had no idea you could use glitter & then color it. How cool is that! Love the colors and the glitters. 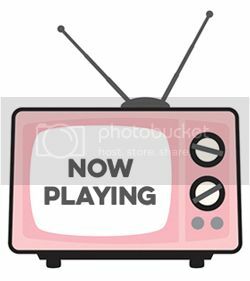 Fun images. Love my coffee and your card. I love this! So pretty and the addition of glitter is a great finishing touch!! Of course, I don't think ANYTHING is finished without glitter! I love coloring my glitters to match my projects! Thanks for sharing this fun tutorial! Love the coloring and textures! Beautiful card! (Now I have to head to Starbucks for a peppermint mocha... your card made me crave one)! So pretty!! Love the shading on your coffee cup - I never knew you could color on top of glitter, much less stamp on top of it! Thank you for your awesome tutorial over at Ellen Hutson's classroom! Great card. The colors are so pretty and sparkle-y. I get so much inspiration from you. Love your card and so happy to see you joining Ellen's team as a guest designer!